Would You Try a Reindeer Hotdog for Christmas? You are here: Home > Las Vegas Christmas > Would You Try a Reindeer Hotdog for Christmas? If you like hot dogs, Steamie Weenie in Henderson has an interesting treat (challenge?) for you, a reindeer hotdog. 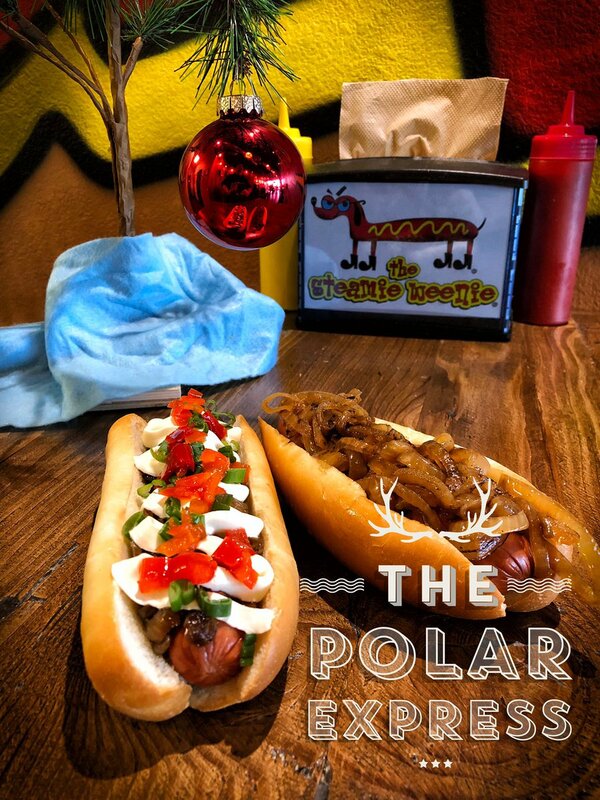 Named the Polar Express, this holiday-themed hotdog is made with with a little beef, a dash of pork, and yes--reindeer. If comes in two varieties, "nice" or "naughty". The "nice" variety hot dog is topped with grilled onions while a "naughty" dog comes wrapped in bacon and a creamy sauce on top of the onions. How do most people like their reindeer dog? "A little bit naughty" says Bob Remington, owner of Steamie Weenie. The taste, for the most part, is similar to a traditional hot dog, with a touch of gaminess to create a richer flavor. Bob also said that "most people like to be a little bit naughty" when deciding which Polar Express dog to eat. Would you try it? If you're not into reindeer hotdogs, Steamie Weenie offers 20 hot dog varieties or you can customize your own with a choice of seven sausages and 40 toppings. Steamie Weenie is located at 1500 N. Green Valley Parkway in Henderson, inside Pebble Marketplace.